This headcovering is easy, lightweight and extremely comfortable. Made with soft, 100% cotton, this easy to tie scarf is lightly padded around the face which adds fullness to the hairline for a more flattering look. The padding around the face is oh so comfortable, and the soft cotton material feels soothing on sensitive scalps. This one won't itch or scratch. We know you're going to love this look! Named after our founder, this style was one of her favorites during her second battle with cancer, when she lost her hair once again to chemo treatments. 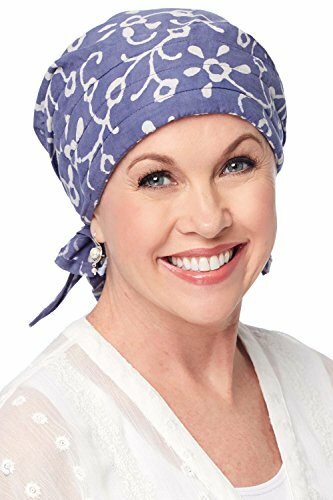 When tied, this scarf provides full head coverage, perfect for any woman suffering from hair loss due to cancer, chemotherapy, alopecia, or any other medical hair loss condition. To tie, simply place the padded area of the triangular shaped scarf at the top of the head. Tie the two ends on each side of the head into a knot or bow around the back of the head and you are good to go! It's easy to tie form allows it to be used by chemo patients who might not feel up to intricately tying a flat scarf. If you like this scarf, you might also like our Carol Scarf in Cotton Interlock. Provides total head coverage for women with hair loss due to cancer, chemo, alopecia. This style is one size fits all. Gives a lightweight, yet secure feel. Padding in the front gives the illusion of height to a bald head. Simple, easy to tie design. 100% cotton. If you have any questions about this product by Headcovers Unlimited, contact us by completing and submitting the form below. If you are looking for a specif part number, please include it with your message.